Q: The US State Department said that the US is deeply disappointed by El Salvador's decision to break its "diplomatic ties" with Taiwan in favor of China and is reviewing its relationship with El Salvador as a result. It accuses China of unilaterally altering the status quo and urges China to abstain from coercion that would jeopardize the people of Taiwan. The US Ambassador to El Salvador said that this will impact the relationship between the US and the Salvadoran government. The American Institute in Taiwan said that China's efforts to unilaterally alter the status quo are harmful and do not contribute to regional stability. There are also US senators calling for cancellation of US aid to El Salvador. What is your comment? A: An independent sovereign state has the right to determine its own foreign relations. This is true for both China and El Salvador. We two countries established diplomatic ties on the basis of the one-China principle. This corresponds with the trend of the times and the development of the international situation. It conforms with international law and basic norms governing international relations, serves the fundamental interests of the two countries and two peoples, and will not affect our respective relations with other countries. The Salvadoran government made the same right choice as the UN and other 177 countries. Others are in no position to interfere in it or even try to deter it. The US established its diplomatic ties with China almost 40 years ago. But now, it is threatening another sovereign country not to recognize the one-China principle and develop normal relations with China while allowing Tsai Ing-wen to stop over and attend activities in the US. The Chinese people are firmly opposed to these unreasonable actions. 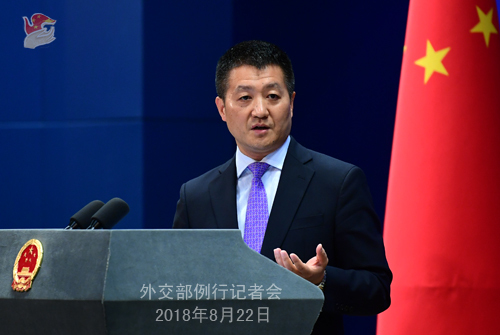 We urge the US to abide by the one-China principle and the three China-US Joint Communiqués, view the establishment of diplomatic ties between China and El Salvador in an objective way, cautiously and properly handle Taiwan-related issues, and make sure that no wrong signal is sent out to the Taiwan independent forces so as to avoid damaging China-US cooperation and cross-strait peace and stability. Q: According to reports, on August 19, Afghan President Ashraf Ghani announced a three-month ceasefire with the Taliban starting from August 20 which is conditional on Taliban's participation. This ceasefire is meant to celebrate the Eid al-Adha. What is your comment? A: The Chinese side commends the Afghan government on proposing another temporary ceasefire with the Taliban. We sincerely hope that Afghanistan can achieve peace and stability at an early date and that all relevant parties in Afghanistan can make concerted efforts to end conflicts and start peace talks as soon as possible. China firmly supports the Afghan-led and Afghan-owned reconciliation process. We are willing to continue with our constructive role in this regard. Q: First, foreign media reported that China is stepping up its pressure on Swaziland to switch its ties to the mainland as the FOCAC Beijing Summit draws close. What is your response? Second, reports say that neither China nor the US are optimistic about any progress coming out of this round of trade talks starting from today. China may consider some of the requests raised by the US side, but those concerning national security are out of the question. What is your response? A: Regarding your first question, Assistant Foreign Minister Chen Xiaodong already gave an answer during this morning's press briefing. I can repeat it for you. The one-China principle is the consensus of the international community. 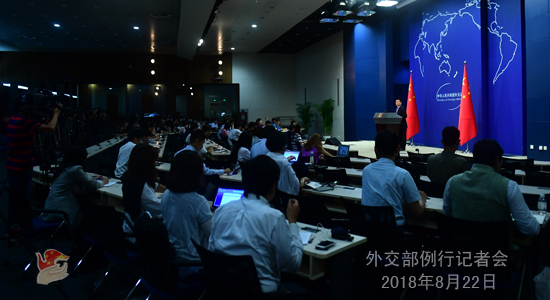 The Chinese government is always ready to forge friendly and cooperative ties with all countries in the world on the basis of the Five Principles of Peaceful Coexistence and the one-China principle. We sincerely wish that the relevant country could make the right decision for itself sooner rather than later, one that conforms with the trend of the times, the development of the international situation and its own interests. We look forward to seeing it pledging to the one-China principle and joining the big family of China-Africa friendship and cooperation at an early date. As for your second question, I took similar ones yesterday. Since China and the US have started to talk to each other, we hope that these talks could lead to a good outcome that is acceptable to both sides and beneficial to the business communities and consumers of the two countries. I want to reiterate that we prefer no disruptive speculations prior to the talks. We hope that China and the US could sit down calmly, talk to each other in earnest, and reach a mutually beneficial outcome. With talks still underway, we don't think that either party feels that now is the right time to disclose relevant details. I believe that you could understand that. Q: According to reports, Indian Prime Minister Narendra Modi recently wrote a letter to Imran Khan, the newly-elected Pakistani Prime Minister, saying that his country hopes to have constructive and meaningful engagements with Pakistan and is committed to establishing peaceful and good-neighborly relations with Pakistan. In his victory speech, Prime Minister Imran Khan also said that Pakistan is willing to resolve all disputes with India through dialogue, including the Kashmir issue. He added, "If India takes one step forward, we will take one more". What is your comment on the latest developments in Pakistan-India relations? A: We have noted relevant reports. We welcome the positive remarks made by the leaders of India and Pakistan on improving their relations. Both Pakistan and India are important countries in South Asia. The improvement and development of their bilateral ties are very important to regional peace, stability and prosperity. As a neighbor to both Pakistan and India, China sincerely hopes that the two sides could enhance dialogue, increase mutual trust, properly handle and resolve differences, and make joint contributions to regional peace and development. China is willing to play a constructive role in this regard. Q: Since last night EST, we have been hearing a lot of news about the US administration, leaving the impression that the US politics is a mess. Do you think their messy situation will affect China-US trade talks? A: You should know that we never comment on the internal affairs of other countries. As to how the US politics affect China-US trade talks, I want to say that if there is any, we certainly hope that the influence is positive. We do not want to see any disturbance or negative influence. Q: Has China agreed with the Malaysian government's decision to cancel for now the East Coast Rail Link and two gas pipeline projects? A: I responded to this question yesterday. You may check on our website for the transcript of yesterday's press conference. During Prime Minister Mahathir's visit, both sides had an in-depth exchange of views on issues of mutual interest, including economic and trade cooperation. Both sides agreed that strengthening bilateral cooperation on trade and investment is mutually beneficial. Prime Minister Mahathir himself also mentioned that China's development is Malaysia's opportunity and China is now the largest trading partner for Malaysia. As for some problems arising from bilateral cooperation, I also said yesterday that leaders of both sides agreed to continue to properly resolve relevant issues through friendly consultations. Q: According to reports, ROK Defense Minister Song Young-moo said on August 21 that the DPRK and the ROK have agreed to close over ten guard posts in the Demilitarized Zone on a trial basis. This is meant to accumulate mutual trust and may lead to more post reductions. What is your comment? A: We have noted relevant reports. We are happy to see that the DPRK and the ROK are actively implementing the consensus reached by their leaders and the Panmunjom Declaration and some new progress has been achieved. The Chinese side always believes that the two sides continuously promoting reconciliation and cooperation is conducive to cementing their mutual trust, bettering their relations, and continuously improving the situation on the Korean Peninsula. 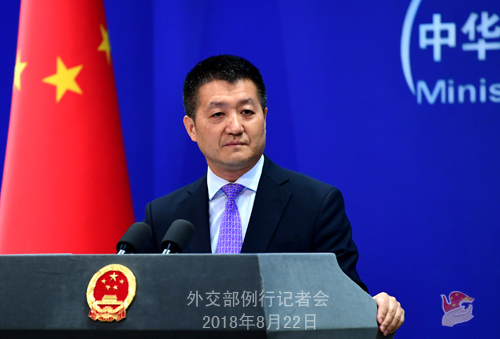 China will continue to work with the international community to support the DPRK and the ROK in improving their relations and create favorable atmosphere to sustain the momentum for dialogue, advance the denuclearization of the Korean Peninsula and move forward the political settlement process of the Korean Peninsula issue. Q: Regarding the answer you just gave about India and Pakistan, you said China would like to play a constructive role. What do you mean by that? A: I just said that we are very glad to see these positive statements made recently by the Pakistani and Indian leaders on improving bilateral relations. Any thing that will help the two sides improve relations continuously and contribute to regional peace and stability deserves recognition. As long as there is any possibility, China certainly would like to play a positive and constructive role. Q: Are you trying to suggest that China plans to mediate between India and Pakistan? Because early there have been reports that your ambassador to India once suggested that China would like to play some kind of mediation role between India and Pakistan. A: I cannot make a prediction for you at this moment as to when and how China will do something. But it is obvious that playing a constructive role means advancing, consolidating and sustaining positive momentum.